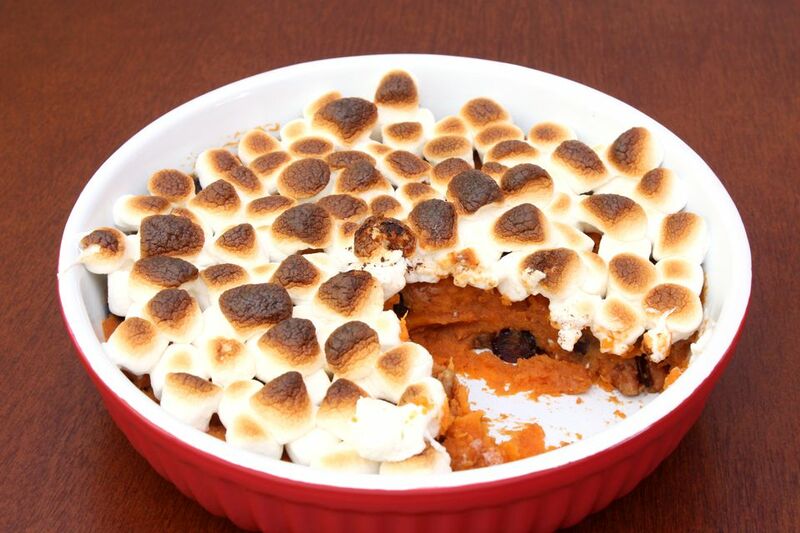 You can make this sweet potato casserole in advance. Just bake the sweet potatoes without the marshmallows, cool, wrap tightly and refrigerate. Just before serving, heat in a 350 degree-oven for about 15 minutes, then add the marshmallows and bake 5-10 minutes longer. Preheat oven to 350 degrees F. Spray a 1-1/2 to 2-quart baking dish with cooking spray. Wash and prick potatoes with a fork several times. Place on a baking sheet and bake 1 hour. Alternatively, place on a paper towel in the microwave, and heat on high 6-12 minutes until soft. Add remaining ingredients except marshmallows. Puree until smooth. Pour into prepared pan. Bake 30 minutes. Remove from oven. Spread marshmallows over top of casserole. Bake another 5-10 minutes on the top rack, until the marshmallows brown. *The reason I use a food processor is to make sure the stringy parts of the baked sweet potatoes get smoothly mixed in. Alternatively, you could use a blender (though it's messier), or an electric mixer. Making a Sweet Potato Casserole in Your Instant Pot—Topping Including!